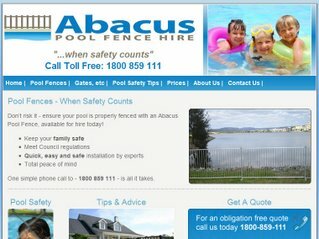 We’ve just completed a web site for a mate of mine who has a pool fence hire business here on the Gold Coast, Australia. The local laws say that when you dig a hole for a pool deeper than 1,000 mm then you have to have a fence around it. This is the case, of course, when an in-ground pool is being built. My client hires you a pool fence for the duration of the pool being built, before you install your permanent pool fence. All in all, a simple site that is very attractive, functional and easy to use – and developed pretty cost effectively. It should be a great asset for the business. So if you’re looking for an example of a nice, easy site – then Pool Fence Hire could be the perfect example for you.